Air Conditioning Special Offers, Air Conditioning Maintenance, Services offers, Commercial and Domestic Northamptonshire. UK. This system is suitable for a medium sized office or alternatively a small convenience store. Includes fully programmable hard wired controller. This system is suitable for a small office or server room. Includes fully programmable hard wired controller. Note: The above prices are fully installed for pipe runs less than 5m and are subject to a site survey. The prices exclude the provision of mains electrics, any auxilliary condensate pumps and the hire of any specialised lifting or access equipment. 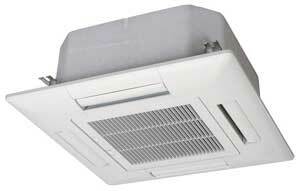 We are able to supply and install all major brands, types and sizes of single split, multi splits and VRF systems. Please call today with your specific requirements. Are you aware that SME's may be eligible for a Carbon trust interest free loan. Also, all Mitsubishi Heavy Industries equipment qualifies for the Enhanced Capital Allowance. Please call now for details. All Mitsubishi Heavy Industries equipment qualifies for the 5% reduced rate of VAT. This applies to the total installation cost and includes the cost of any additional building or electrical work necessary. Please call now for details. We are able to provide highly competitive maintenance contracts covering all types and brands of equipment. All routine maintenance is carried out strictly in accordance with manufacturer's recommendations & any statutory legal requirements. Call now for a quotation. We pride ourselves on the quality of our workmanship and customer service. All our engineers are fully compliant with the latest regulations and are F-Gas qualified (C&G 2079 Category 1).The majority of our work is repeat business or from recommendations. We are more than happy to provide references. Alternatively, we are able to arrange viewings of similar local installations for total peace of mind.